The Rapa Nui School of Music and Arts was born with the objective of rescuing the Rapanui art and culture through a space that fosters the integral development of the children and youth of Easter Island. The building, still under construction, will become the first self-sustaining school of music in Latin America. 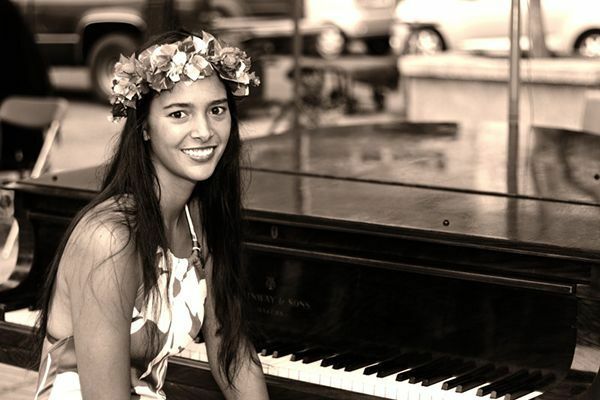 Mahani Teave is the first piano performer of Rapa Nui origin. She has gained international recognition for her performances and has won several national and foreign awards in her still short musical career. When Mahani was a child, she began to study with the only teacher and the only piano on the island. But one day the teacher left, and classes were over. Her mother then decided to move the family “to the mainland”, as the Pascuenses call Chile, to the southern city of Valdivia, where she continued forming until passing through the United States and Germany where she managed to become one of the most recognized Chilean concertists. After finishing her studies in Germany, the pianist felt the need to do something for her beloved island, because being such a small and isolated place, the opportunities are scarce. So in 2011, Mahani along with Enrique Icka and a group of young islanders, created an NGO called Toki, which in the Rapa Nui language defines the tool used by their ancestors to shape the moai, the emblematic rock statues of the island. Its objective is to develop a cultural space where to preserve and promote the music, arts and traditions of Easter Island. 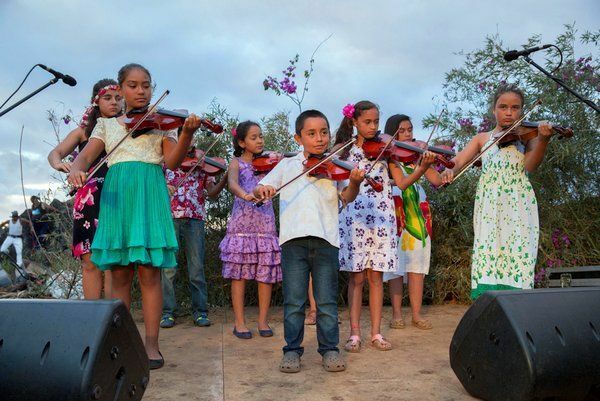 In 2012, thanks to some donations of instruments, Mahani managed to start her great dream, the Rapa Nui School of Music, which currently teaches free to more than 70 students and where there is even waiting list to enter. The School of Music teaches piano, violin, cello and ukulele; but they lacked a physical space to perform all these classes. They have been doing it in a room borrowed by the parish and in the homes of the same teachers. The next step was to build a new headquarters for the school. In order to make the dream come true, NGO Toki has land donated by co-founder, musician and construction engineer Enrique Icka and the design of the American architect Michael Reynolds known in the world as “Garbage Warrior.” Reynolds, leader of Earthship Biotecture, uses a construction system that combines basic materials such as cement with reused elements such as aluminum cans, glass bottles and tires. In this way he obtains self-sufficient and ecological constructions that obtain electricity from the sun and the wind; the water from the rain; the heating and cooling from the sun and the earth. This system has used it for more than 40 years and has built in places as diverse as Malawi, Ushuaia and New York. 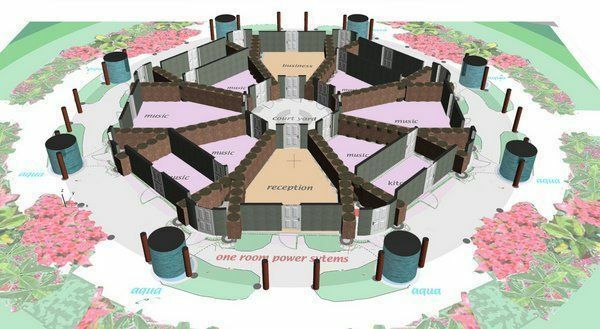 The school building was conceived as an eight-petalled flower. 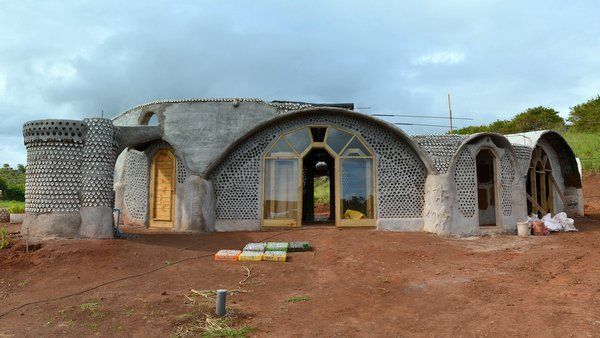 In it there will be rooms where classes of music, dance and rapanui culture will be taught, a TOKI NGO office, a reception room, kitchen, showers, toilets and cellars. Construction began in November 2014 and on December 17 of that year the first stage was inaugurated. It is expected that by 2017, the School of Music and Arts will have about 225 students. These recycled tires, cans and cartons mark the shift towards innovation, towards more opportunities, to teachings that are consistent with the rapanui cosmovision, to avoid the cultural and environmental loss that the island is suffering today. The NGO Toki seeks to make positive changes, providing a space for the holistic development of people. Today violin, piano, cello and ukulele classes are taught, but the idea is to incorporate more disciplines that help to rescue the local heritage. There will be workshops on stories and ancestral songs, along with other practices such as herbal medicine, which will bring the children together with the elderly, who are the bearers of wisdom. It is intended to create a library where the wealth of the island, videos, recordings, etc. will be stored. And international cultural meetings will be organized where indigenous groups from the Americas, Oceania and Africa will be able to participate, who have known how to take care of their culture and who can transfer the experience. Traditional music from the island consists of choral singing and chanting, similar to Tahitian music. Families often performed as choirs, competing in an annual concert. They were accompanied by a trumpet made from a conch shell and a percussive dancer jumping onto a stone which is set over a calabash resonator. Other instruments include the kauaha, the jaw bone of a horse, upaupa, an accordion, and stones, which are clapped together for percussive effect.